The West Midlands Pension Fund (WMPF) have asked the councils to pay an extra £100m this year because of the fund’s £2.8bn deficit. The fund has more than 287,000 members working for about 520 employers. Local councils have seen their budgets cut heavily in recent years. Birmingham, which has been asked to contribute £65m of the £100m, has had to reduce its spending by £500m during the past six years and expects to have to cut another £250m by 2020. “The hard-pressed citizens and taxpayers in Birmingham should not be asked to find £65m a year to bail out investment fund managers,” said John Clancy, Labour council leader. The WMPF spent £69.8m on managers in 2015/16, down from £81m the year before. It is budgeting £72.8m for 2016/17. The WMPF has returned 5.6 per cent annually during the past decade, beating the benchmark of 5 per cent. The retail price index has risen by an average of 3 per cent annually. Labour councillors for Birmingham, Solihull, Coventry, Wolverhampton, Dudley, Sandwell and Walsall are trustees of the WMPF but are poised to reject its professional advisers’ request for the £100m “top-up” fee.The WMPF noted that it had cut running investment costs by £11m in 2015/16 to £69.8m, 0.6 per cent of assets. WMPF plans to pool resources with eight other funds to create the LGPS Central, which will have £65bn in assets. It should save £200m in annual costs by 2034. ‘Employer contributions to the pension scheme are deferred pay. They are not an optional part of membership of the scheme. They are part of the employees’ contractual terms and conditions. Central government underfunding of councils should not be used by the employer as an excuse for undermining the pension scheme. All pension schemes have been put under pressure this year due to low investment returns caused by recent instability in the financial markets. The schemes make investments for long-term returns, and short-term fluctuations do not provide evidence of pension funds underperforming or being unsustainable. If the employers were concerned about the efficiency of the schemes, they could have identified these savings in running costs and influenced the pension schemes to act earlier if they had been so minded. UNISON’s success in getting members represented on pension boards has allowed greater transparency in the schemes’ running costs. Identifying ways of reducing these costs doesn’t absolve the employers’ from their responsibility of paying their employees’. The government has laid in Parliament a new set of LGPS investment regulations and guidance they will become law on November 1st 2016. The debate is between 4.30 and 7.30 in Westminster Hall. The regulations are instructions to the LGPS administration authorities on how to invest scheme member’s pension funds. Over 100,000 scheme members and others have signed a Parliamentary Petition requesting that the LGPS funds be invested in the scheme member’s interest. Over 23,000 responses to the government consultation were received opposing the new regulations. – These regulations require the LGPS funds to be invested in accordance with UK Foreign policy – this is unheard of. – The regulations also give the Secretary of State powers to intervene in the running of the LGPS funds – again this is unprecedented. 1. The regulation is in breach of Article 18 of the EU Directive Institutions for Occupational Retirement Provision or IORP (pension funds must invest in the best interest of their members). 2. The Government’s proposed intervention power could bring about circumstances that would lead to a breach of Article 18(3) of the IORP Directive which says that member states shall not require institutions to invest in particular categories of assets. The requirement to invest in accordance with UK foreign policy is a breach of the obligation to invest in the best interests of scheme members. The funds have a legal duty to meet the pensions of members and selling assets without due care to this requirement would mean the funds are in breach of their obligations to members. Powers of intervention should be a matter for regulators not of government Ministers in the field of pensions. DWP Secretary of State has no powers of intervention over the schemes under that department. The LGPS has the Scheme Advisory Board and the Pensions Regulator to ensure that the funds are operating within the regulations. – The investment regulations UNISON is clear that funds’ investment policies should be guided by what is the ‘best interests’ of scheme members, not by government which is required under law. The UK government is denying the scheme members of the LGPS their statutory right to have their pension funds invested in their best interests. – The government has instructed the 89 LGPS administering authorities to come up with proposals to create ‘pools’ of assets of no less than £25bn in size. Initial plans must be drawn up by the end of February 2016 and finalised by July 2016 the new investment regulations make this a legal requirement. UNISON supports the pooling process but with qualifications, there should trade union nominated scheme member representatives appointed to the pool governance structures. – These pools of assets, (or Collective Investment Vehicles) will be expected to be cost transparent, reduce the costs of investing and invest more in infrastructure. UNISON supports the cost reductions and income improvements but the law requires pension funds to invest in the best interests of scheme members therefore infrastructure investing must be in scheme members interest not the governments. The requirement for a full cost analysis of all of the LGPS funds is an endorsement of UNISON’s consistent demands over the last five years for transparency of costs. – What is the remedy to prevent the government forcing the LGPS funds to invest in the interests of the UK government and not scheme members? The LGPS must become compliant with the EU ‘IORP’ Directive – this requires a judicial review or a complaint to the Commission so that it can take infringement proceedings against the UK government. The pooling process has been carried out without any Parliamentary scrutiny and no involvement of the LGPS trade unions. The government must be bought to account for the seizure of unprecedented powers of intervention and instruction to invest according to UK foreign policy. The impact on pension fund investments with a vote to leave will likely be significant. Defined Benefit funds will see deficits rise and Defined Contribution funds will fall in value and ultimately in their ability to deliver something to live on. There will be a short-term negative impact on UK growth, and part of that could feed into lower growth in Europe. This could have huge implications for gilt yields which would impact Defined Benefit (DB) schemes. The effect on yields will depend on how much the likelihood of Brexit is already priced into the market. Although it would appear to be priced in given the market has already adopted lower yield expectations, evidence of falling US yields suggests this may not be the case. UK equities are widely expected to tank following a Brexit vote but again how much they fall by depends on the extent to which the risk has already been priced into the market. The impact of the referendum on equities has probably been muted because the UK market is so international. More pressure on the riskier assets is likely. As for sterling, which is expected to fall 10% following a Brexit vote, the impact on pension funds depends on how much they invest overseas. If we see a sharp fall then we will see currency gains from overseas assets – so schemes could see a degree of currency benefit from those overseas assets they’re holding. If overseas markets are negatively affected by Brexit, the value of those oversea assets may fall, affecting pension schemes negatively. Keep Osbourne’s hands off our Pensions! Tory Chancellor George Osbourne is trying to plunder the local government pension scheme (LGPS). The government is seeking powers to direct Council pension funds to pay into their pet infrastructure investment schemes and make them only invest in accordance to the current UK Government’s foreign policy. British foreign policy is questionable in regard to totalitarian regimes. Such regimes are often economically unstable and any investment would therefore be unsafe for our pensions. Local government pension funds should be the ones making investment decisions, since they will have to carry the responsibility if it all goes wrong. There is no protection for these schemes if they make the wrong investments decisions and the schemes collapse as a result . 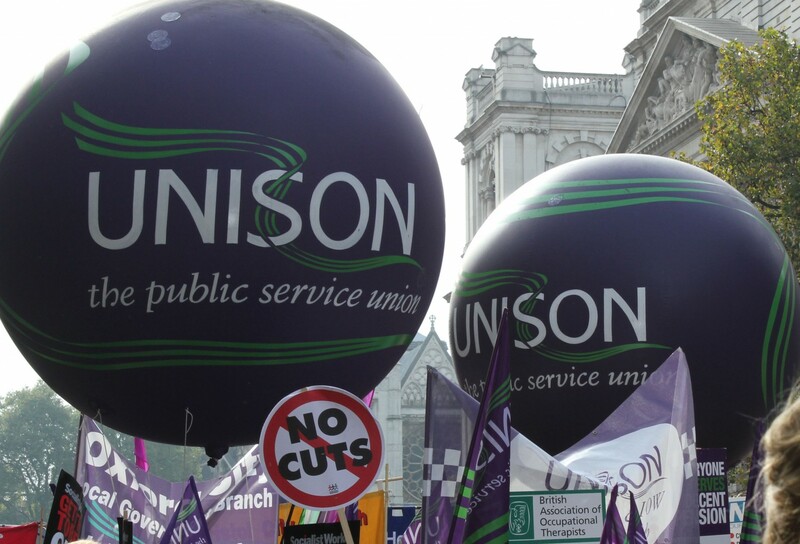 Since there has been no debate in Parliament on this “nationalisation” UNISON is encouraging its members to sign this Parliamentary Petition https://petition.parliament.uk/petitions/125475 to get a debate in the House on this matter. 1 October is International Day of Older People. 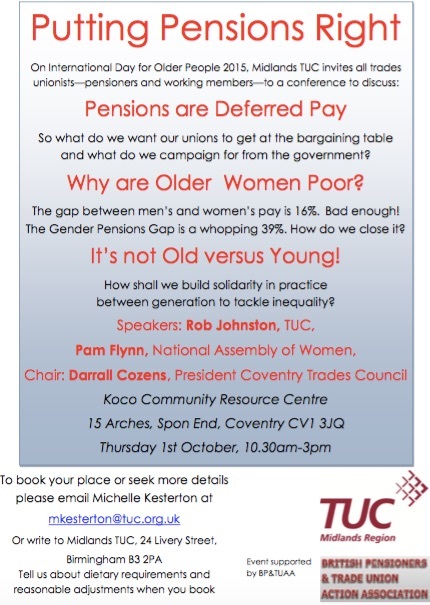 The Midlands TUC and Coventry British Pensioners Trade Union Action Association are holding an event at Koco Building, The Arches, Spon End. This event is open to all, not just retired people. We will be exploring pensions issues and considering how we ensure that the older generation is not set against younger generations. All welcome but please let Michelle Kesterton (see link) know as soon as possible for catering/access issues. Click on the link below to download the pdf of ‘Union Street News’ – articles sent from #Coventry on our services, mental health in the workplace, arms trade, not liking Britain First and more. The Department for Communities and Local Government (DCLG) launched a consultation on structural reforms to the Local Government Pension Scheme (LGPS), which closed on July 11th 2014. In 2012 the government launched a call for evidence on structural change. UNISON’s submission called for the merger of LGPS funds and for asset management to be bought in-house, to eliminate fees, increase income by £1bn a year and create public sector jobs. At the end of 2013 the DCLG set up a further review. Hymans Robertson, who are investment advisors to a significant number of LGPS funds, has found that as much as £660m a year could be saved through better use of common investment vehicles. 1. Establishing common investment vehicles to provide funds with a mechanism to access economies of scale, helping them to invest more efficiently. 2. Reducing investment fees by using passive management for listed assets. 3. Keeping asset allocation with the local pension fund authorities, and making available more data to help identify the cost of investment and drive further efficiencies.  Merged funds would provide for greater savings, more accountability and transparency.  UNISON has a legal opinion that the governance structure of the current funds is unlawful. The governance of pooled funds would add further complexity and costs.  The proposals require scale, compulsion and legislative change. This approach introduces additional risks and delays.  Total passive management of funds could make them inflexible. Active management carried out in-house would not carry the high costs charged by profit making external managers.  Governance of any pooled arrangement must have equal numbers of employee and employer representatives.  Pooled vehicles should be run by in-house investment teams so avoiding hidden transaction costs.  Any cost reductions should be shared by both employers and scheme members. The Treasury should not be allowed to siphon more money away from the LGPS.